Tile flooring is a great choice for a number of rooms within your home due to its versatility and durable nature. But when it comes down to cleaning this type of flooring, it can be difficult to maintain. 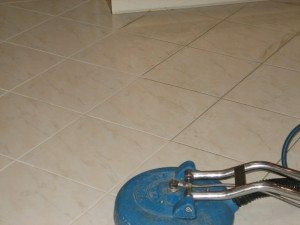 Over time, the porous surface of tile absorbs dirt, grime and other messes, leaving your home or business with a dark, dingy looking floor. While a dirty floor can be fixed by getting down on your knees and scrubbing away for hours, it’s much easier to hire a professional to clean your tile and grout. At Diamond Tile & Grout Restoration Specialists, we have a proven floor refinishing cleaning process that will leave your floors sparkling clean long after we’re finished. Using a turbo power rinse, dirt and grime are blasted away with heated high pressure water, leaving your floor clean & sanitized. After the initial cleaning, our team performs a thorough inspection of the floor for any deep stains and spot clean as needed. Instead of spending thousands of dollars on brand new replacement flooring, give us a call. With Diamond Tile & Grout, you’ll save time, money and effort when it comes to your flooring. Our professional services restore your tile and grout back to that original shine without any effort on your part!